The slogan of Wood Violins “Finally it’s cool to play the violin” underlies its ambition to allow violinists to explore grounds that were previously the territory of guitar players. 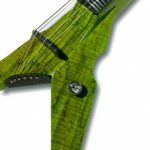 The first group of Wood violins have a somewhat traditional electric violin design. The Stingray and Sabre look and feel the most like conventional violins. 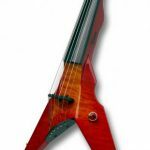 Both are fretless instruments and come with a custom-made pegbox and chin rest. Sabre and Stingray have grooves in the sides where the shoulder pad can easily be attached. The main difference between both is the shape of the body. These instruments are available in 4, 5 and 6 string versions and in a wide range of finishes. The Viper is rather different. Most remarkable is the harness that gives more freedom and causes less strain for the player. 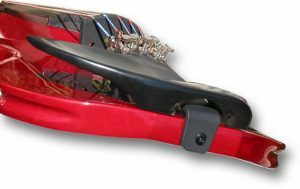 It is equipped with a unique Chest Support Sustem (TM), strapped around your back, which makes the instrument fully self-supporting. The instrument is played without shoulder pad and chin rest: you can continuously stand up and play for extended periods without experiencing the typical neck and back fatigue. 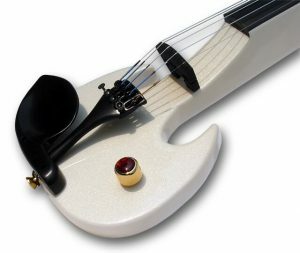 The Viper violin is available in 4,5, 6 and 7 string versions, with or without frets, and with Schatten or Barbera pickups (the Barbera is an upgrade), in a large range of finishes. Little detail: you can even choose whether you want the hardware (volume knob, jack inputs, …) in black, silver or gold. The Viper is the instrument that should give the violinist the same freedom as the guitar player. Since fretted versions are available as well, the Viper may also be an option for guitar players that brave enough to enter the violin world. The frets are also specifically designed for violin. The upper part is filed to cause less friction when shifting your fingers. The design of the frets still allows for smooth slides but also gives you some guitar-like possibilities. It is Mark Woods personal experience in touring, performing and exploring that has led to the development of these instruments, which were initially designed and built solely to satisfy his own requirements. Wood violins are hand-built by master craftsmen Joe Domjan and Mark Wood. Mark calibrates and tests each violin prior to shipment and you receive a Certificate of Authenticity signed by himself together with your instrument.